The ULE Alliance is a non-profit organization based in Switzerland. Promoter members who are interested can apply to become an ULE Alliance board member. This group actively manages the promotion of the ULE alliance in the area of Home Automation, Security and Climate control and organizes presentations, participation in panel discussions, liaison with research companies, interviews, etc. The technical Working Group works on feature profiles, standards together with ETSI and certification programs to guarantee interoperability. 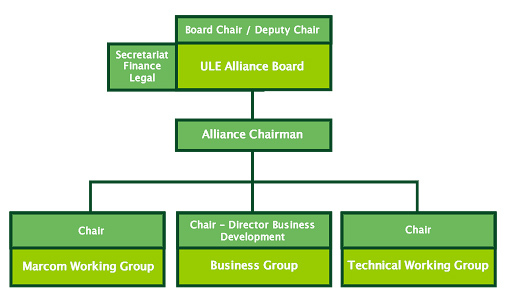 This group works on the ULE technology and Alliance promotion in conjunction with the Marketing Working Group; on the certification program together with the Technical Working Group; ULE Alliance marketing strategy definition, management of liaisons with partner organizations to expand awareness of the ULE Technology and Alliance.